____ doesn't have a girlfriend. But I do know a woman who'd be mad at me for saying that. ____ and then at the end of the letter I like to write "P.S. - this is what part of the alphabet would look like if Q and R were eliminated." ____ My roommate says, "I'm going to take a shower and shave, does anyone need to use the bathroom?" It's like some weird quiz where he reveals the answer first. ____ On a traffic light yellow means yield, and green means go. On a banana, it's just the opposite, yellow means go ahead, green means stop, and red means, where'd you get that banana? ____ wishes I could play little league now. I'd be way better than before. ____ My sister wanted to be an actress, but she never made it. She does live in a trailer. She got half way. She's an actress, she just never gets called to the set. 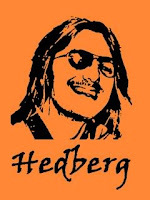 For more funny Mitch Hedberg quotes, click HERE. To become a fan on Facebook, click HERE. You know you want to.